There'd be no 50 nifty United States to celebrate without each of the 13 original colonies. So as the U.S. of A. turns 239, celebrate where it all began with some of our favorite designs along the Eastern seaboard. Connecticut: Steel shingles update the facade of the addition to this traditional 1920s house in New Haven. Delaware: Local brewery Dogfish Head enlisted the help of Brooklyn-based firm Studio Tack to design their 16-room Dogfish Inn in Lewes. Along with a handful of beer-related accessories, such as custom bottle openers, each room features original art by local artist Steve Rogers, unique blankets by Woolrich, and a medley of modern furnishings. Georgia: In Atlanta's elegant Buckhead neighborhood, this 1920s Mediterranean facade hides a minimalist abode filled with modern furniture from Vitra, Kartell, and Knoll, and even vintage Case Study pieces. Maryland: Near Baltimore, the Marcel Breuer–designed Hooper House II, which dates to 1959, remains a shining example of the designer's modernist residential architecture. Massachusetts: In coastal Massachusetts, Walter Gropius's 1938 Hagerty House was designed to sit as close to the ocean as possible, scandalizing the neighbors at the time with its aggressively modern design. New Hampshire: Among the cobblestone streets of Portsmouth, New Hampshire, a former bewery was transformed into a modern boutique hotel, the Ale House Inn. New Jersey: This waterfront prefab on Lake Iosco offers its residents a low-key retreat from hectic city life. "I wanted this house to be a pavilion where you didn’t feel enclosed at all," said resident Debbi Gibbs. "We used every inch of glass allowable under code!" New York: Located off the South Shore of Long Island, Fire Island is an enclave of modernist architecture, including this restored 1963 design by Horace Gifford. Pennsylvania: In Philadelphia, the nation's birthplace, Morris Adjmi Architects designed a hotel for long-term stays in a 1920s building filled with period details. 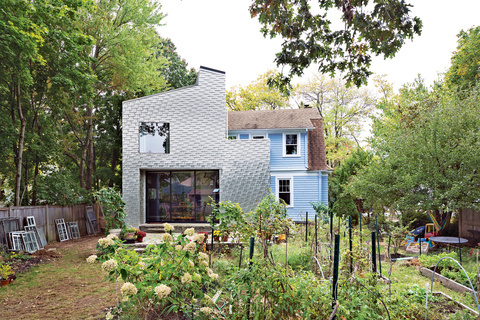 Rhode Island: A modern pavilion brought this 1920s Dutch colonial–style house into the 21st century, while its cedar clapboards keep it cohesive with the original shakes. South Carolina: In South Carolina's Lowcountry, a contemporary house soars amid the oaks and alligators. The remarkably transparent 2,900-square-foot structure it “more loft than house,” says architect James Choate. Virginia: On a wooded lot in the Washington, D.C., suburb of McLean, Virginia, this modern, multigenerational home features floor-to-ceiling windows by Sunshine Glass that offer expansive views of the landscape. The LC4 chaise in the master bedroom on the first floor is by Cassina.